Yin Yoga Classes are the perfect balance to your Vinyasa / Dynamic Yoga practice and antidote for today's busy, adrenaline fuelled, (Yang), Life Styles. In Yin Yoga we allow ourselves to slow down. Working through a series of supported postures which are held for longer periods of time, usually 3 - 5 mins; working deeply into muscles, joints and targeting the deep connective tissue and fascia, of the body. Allowing for a truly nourishing and deeper release of physical and mental tension. 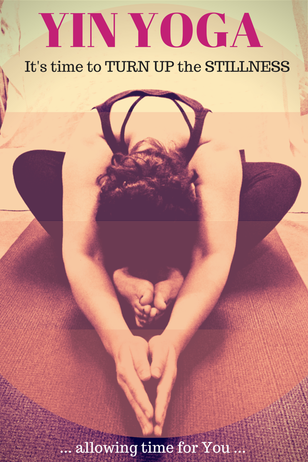 Increasing our flexibility, opening up those tight areas of the body, including hips and back; reducing overall stress levels, whilst replenishing our energy and boosting the immune system. Inspired by ancient Chinese yoga tradition, specific poses stimulate the meridians (energy channels) and organs in the body, helping to supplement deficiencies and stagnation of Qi flow (vital energy); also known as Prana. 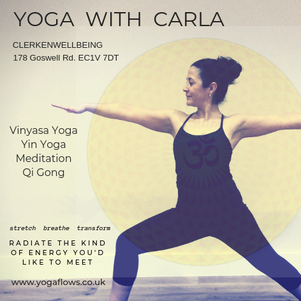 Bringing our body, mind and spirit back into a place of balance, flexibility and ease, whilst increasing our overall sense of Wellbeing. It can be particularly helpful if suffering from fatigue, depleted mental and physical energy. A deeply mindful and restoring practice, allowing for stillness and space. Enabling us to reconnect with greater awareness to our physical body, feelings and sensations; whilst developing a better relationship and understanding with ourselves and the world around us. Both new and existing practitioners ‘Welcome’. Open to all those wishing to improve flexibility in the body and mind and to those looking for a bit of ‘Release,De Stress’ and 'You' Time! Injuries & Conditions: To ensure you enjoy & get the most out of your class 'safely', it's important you advise Carla prior to class of any previous, current or new injuries & any conditions she should know about. Pregnancy: Please let Carla know if you are pregnant or think you may be prior to the class. It's important to keep you and baby safe during your pregnancy. If you are new to Yoga, ideally it's recommended not to practice at least until after your first trimester. Attendance will be discussed on a case by case basis.